I think the parka looks so good with that cute dress! Gives it just a touch of tomboy edge. And your green nails are adorable! great outfits. loved vintage looking dress. Love em!The striped sweater and the parka are to die for! Aaaaaw - I am crazy about the bag and the sweater!! So lovely!! Your jumper is unbelievably cute! 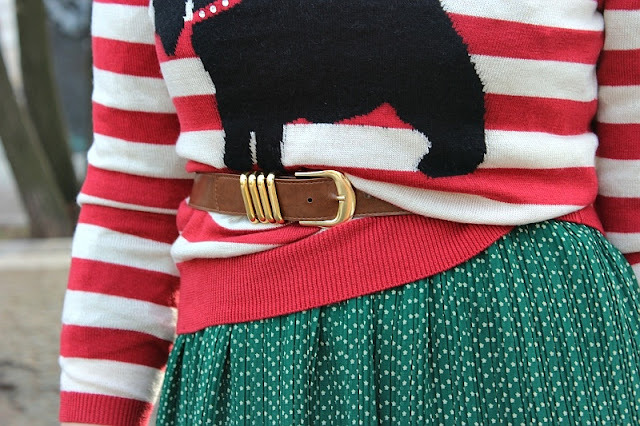 Love the last look with the dots and the doggie from the stripes... So cute! Both of these are so adorable! Love the festive feel of the jumper! Love both looks! I prefer the boots from the first pics, rolled down! I love how have you mixed clashing prints!! Both looks are fabulous! I love the earrings in the first outfit! What a beautiful polka dot dress! The studded boots are perfect with it! In love with the prints combo! love that skirt with the pullover, they look gorgeous together! that jacket looks totally comfy! and i have to admit i'm loving that cute dress too! FAB OUTFIT!! !I LOVE EVETYTHINGS!! !THE BOOTS ARE AMAZING!! I love both outfits! The second one is very cute and christmassy but my love goes out to the first one with the hot boots and the ear cuffs! Man, I love earcuffs and these are just gorgeous! The parka and the green polkadotted dress look awesome together, too. I SO love parkas :D. And those booties are killer!!! I love the parka, and boots! with the heel but I twist my ankle insurance, lol. The parka is absolutely lovely! love your dress and your parka jacket! Important post on my blog. 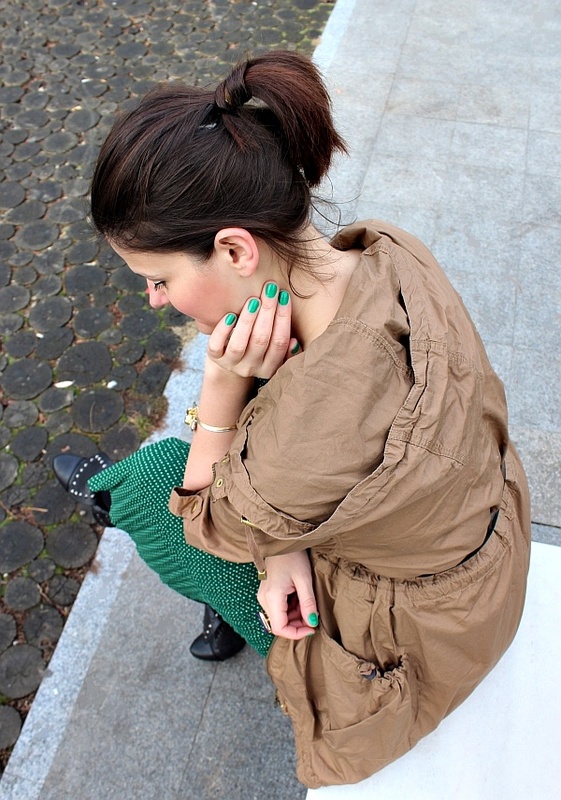 love the parka and ur green nails! Lovely outfit! I love all the different looks you created with the green dress! The boots look very cool rolled down. Love that fur cardigan at the end! Happy new year! I adore your sweater.. too cute.. I do not have google friend connect? I don't even know what it is. If you can help me? Then I can follow you there too. ooo i love your parka and the colour of your dress !! lovely dress (i love love love polka dots!) & super cute sweater!!! happy 2012!! cute nails! !love the parka too!! btw thanks for your lovely comment on my blog. Now following via GFC and will be back to explore more once i have some time!! happy new year sweetie!! The casual parka with a bit of flare from the boots and dress work great. Also thanks for checking out my blog, glad you found me so I could find you! Your blog is amazing. I love your style and those green nails are fab! Love the looks!!! And your blog btw is hot!!! And those booties are too cute! Ooooh I love the parka, I wanted one similar to yours in an olive color. That sweater is so cute, it looks so Parisian. All you need is a beret, a poodle and some baguettes. Ooh la la! lol! Thank you for your comment, and visiting my blog. You are too sweet! 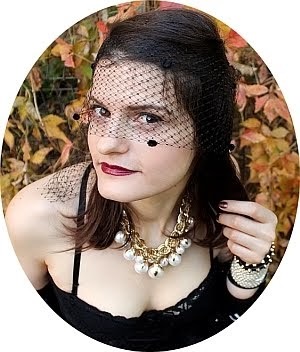 I super love your blog and of course I added you, love supporting fellow bloggers. Stay gorgeous!